Come inside: a meditation on Tadao Ando. It's a rainy day in Osaka, so we'd better stay inside and watch the night unfold. It only takes a few seconds of this short video to feel like this, but how can it be possible as we are probably watching it from miles and miles away? At The Architecture Player we often discuss about the advantages or disadvantages of showing architecture through video: what should the role of this media be? Should it present architecture in motion? Should it transform places, make them almost unrecognizable, display buildings? It is surely the best way to present post-occupancy reports, to inhabit, live up places: a great part of our archive tries to use this medium in innovative ways, never chasing to come up with new ideas, new ways to rethink both architecture and film. "A rainy day in Osaka", instead, wants us to look closely to the work of Tadao Ando, in order to learn something about it, about the way we can build and design residential units: simple as that, when asked about the nature of their work, Luca Sabbadini and Alban Wagener say: "Using this medium, we want to make architecture accessible for people and students who don't have the possibility to visit these exceptional spaces". Born in 1941 in Osaka, Japan, Tadao Ando is an internationally famous, Pritzker Prize awarded, self-taught architect, whose style was defined by Francesco Dal Co as "critical regionalism". His work has been also told to reflect the “haiku” style, which means that it relies on empty spaces and the display of natural phenomena to represent the beauty of simplicity. 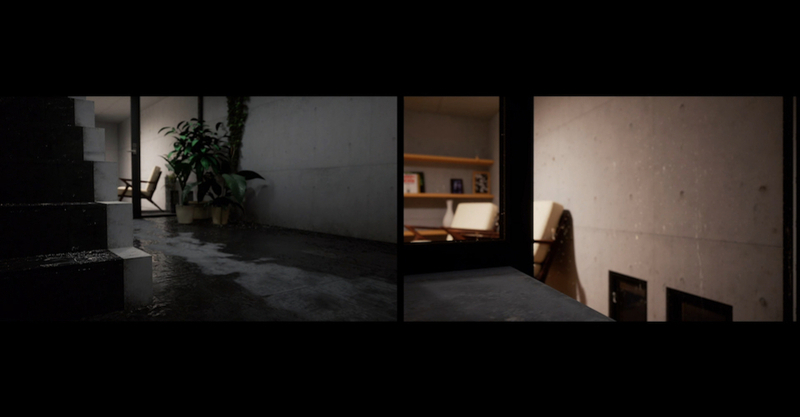 Look for yourself in this video, Sabbadini and Wagener presents the "Row House of Sumiyoshi" or "Azuma House", a low-budget rehabilitation project of the middle unit in a "nagaya" style multiplex, that acted as a modern interpretation of the traditional Japanese house. The rain, the windows, the minimalistic lines: Wagener and Sabbadini create what we could call almost a synesthetic film, dividing the video in two halves, relying on chill-out music mixed with the sound of the rain, falling on concrete floors. The Azuma house is mostly shown from the outside, but what we really see in this video is the continue and intelligent discourse between the occupants and surrounding nature. Transparent glazing rhymes here with layers of concrete and with wooden interiors that help warming up the living space. Azuma house was designed as a two-storey high courthouse closed on the front and back façade to guarantee the intimacy of the inhabitants, explains Sabbadini and Wagener, and the courtyard's walls are framing the sky and brings the habitants in contact with the elements like in traditional ryokans. No surprise if this was first recognized with the Award of the Architecture Institute of Japan in 1979 and still is a great source of inspiration to architects. Even from different backgrounds: Wagener, in fact,finished his master's degree in architecture at the Technische Universität Wien in 2015 and collaborated with architectural studios, such as David Chipperfield Architects, KSP Jürgen Engel and Hermann & Valentiny, while Luca Sabbadini got his bachelor's degree in Architecture at the IUAV University of Venice. Continuing his studies in Udine, where he has been fascinated by the utopian visions of the "Radical Architecture" of mid-19th century and the way they changed the language of Architecture in which subject he finished his master's degree. They both share the interest in architecture language and digital visualization.